Was the New York Philharmonic’s hiring of Japp van Zweden the best choice? 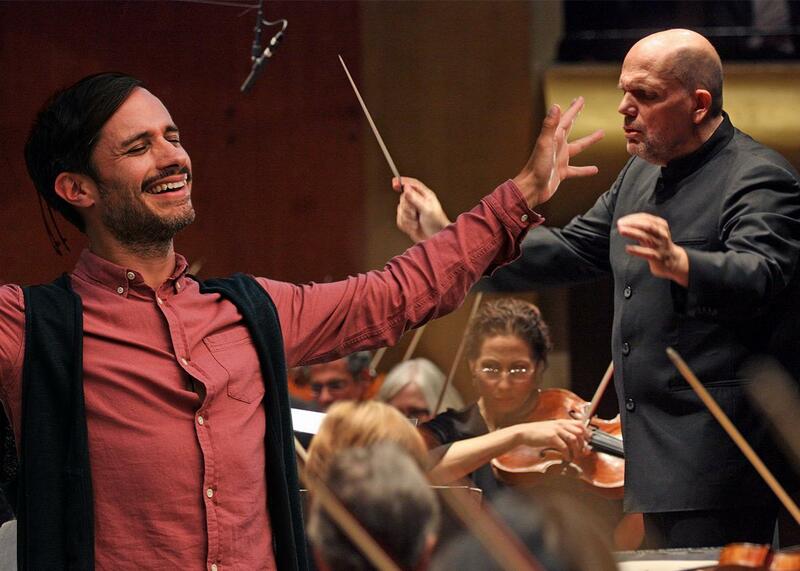 Gael García Bernal as Rodrigo in Mozart in the Jungle and Jaap van Zweden leading the New York Philharmonic, Nov. 20, 2014. Photo illustration by Lisa Larson-Walker. Photos by Ali Goldstein/Amazon Studios, Hiroyuki Ito/Getty Images. The New York Philharmonic ended its yearlong search for a new music director to replace the outgoing Alan Gilbert last week by selecting Jaap van Zweden, an established conductor with an intense, demanding style—and in doing so, followed a conservative path long taken by major orchestras. The Dutch-born van Zweden, currently music director of the Dallas Symphony Orchestra, will begin a five-year tenure with the Philharmonic in 2018, by which time he’ll be 57. Ultimately a safe choice, van Zweden is a European-flavored maestro, known for bringing a visceral excitement to core 19th-century masterworks from composers like Mahler and Bruckner. There’s word that some Dallas musicians have found his bearing too autocratic and abrasive, but his supporters assert that he has lifted the standards of what was long a second-string ensemble. At a press conference announcing the hire last week, van Zweden spoke admiringly of the New York Philharmonic’s traditions and high standards but had little to say about the orchestra’s future—on how to galvanize new audiences, connect with the city’s arts community, or integrate technology into the concert experience. Orchestras across the country have been buffeted by deficits, declining attendance, and labor unrest; and the Philharmonic, while in better health than many, remains a medium-sized fish in a New York cultural pond dominated by Broadway, fashion, and the latest restaurant openings. While a conductor’s first responsibility is to the music, is it possible in 2016 for the face of an arts institution—or one that wants to remain relevant, anyway—to avoid engaging with the social and cultural context in which he makes his art? Van Zweden’s appointment stands in relief against perhaps the most prominent pop culture representation of classical music in recent memory. Two weeks earlier, Mozart in the Jungle, Amazon’s comedy series about a fictional New York orchestra, was named best TV comedy at the Golden Globe Awards. Its star, Gael García Bernal, also won for best actor in a TV comedy. The series centers around Rodrigo (Bernal), a hot young conductor from Mexico who replaces the orchestra’s aging music director (Malcolm McDowell), in a bid to invigorate the stodgy institution. Like any satire, Mozart takes creative liberties. As businesses, orchestras are far more weighed by bureaucracy and institutional caution than what the fictional, Bernadette Peters–managed New York Symphony suggests. Still, Mozart has offered viewers a spritely and irreverent version of the music business that some insiders wish was more true to life. If only orchestra musicians would pack up their equipment and play in city parks on moment’s notice, or conductors took late-night bike rides and joined in impromptu jam sessions with drum circles—then the art form might not seem perpetually in danger of dusty irrelevance. The impulsive Rodrigo is based on Gustavo Dudamel, the charismatic Venezuelan conductor who is the current music director of the Los Angeles Philharmonic (and who makes a cameo in the second season). Dudamel’s appointment in 2009, at age 28, heralded a youth movement among orchestras, as retiring éminences grises were replaced with dynamic, often photogenic leaders. After Dudamel came Yannick Nézet-Séguin (now 40) at the Philadelphia Orchestra, Ludovic Morlot (42) at the Seattle Symphony, and Andris Nelsons (37) at the Boston Symphony Orchestra. In 2008, the New York Philharmonic hired Alan Gilbert, 48, who has helped to present a somewhat hipper outlook through new-music festivals and theatrical productions. But there are signs that this trend is slowing. Last June, the Berlin Philharmonic—Germany’s preeminent cultural flagship—hired Kirill Petrenko, 43, a soft-spoken Russian maestro who is said to be steeped in Germanic repertoire but reportedly hasn’t given an interview in years and was not even present at the announcement of his hiring. The London Symphony last March passed on younger music director candidates in favor of Simon Rattle, 61, a well-established name in the U.K. and abroad. And last month, the National Symphony Orchestra, in Washington, D.C., appointed Gianandrea Noseda, 51, as its next music director. The Milanese Noseda is less easily pigeonholed: Though not a wunderkind, he exudes media-savvy charisma and has shown initial openness to performing in neighborhood bars and other informal settings. So while age might not always directly correlate to community awareness beyond the podium, those baton-wielders who make the effort seem better positioned to ensure their ensembles remain engaged. And engagement is crucial: The same day that van Zweden’s appointment was announced, New York City’s Cultural Affairs Department released a study showing that arts organizations do not match the demographic diversity of the city’s population; in a city where only one-third of residents identify as white, 61.8 percent of its cultural workforce is white. The largest institutions are the least ethnically diverse. Tonally, this is a problem: A fraternal order of artists and administrators from mostly the same cultural background sends a message that this isn’t a place where all should feel welcome. Van Zweden’s own track record with audience-building is somewhat mixed. He doesn’t have a social media presence, and he has mostly delegated outreach efforts in Dallas to visiting conductors and assistants. (After conducting the first installment of ReMix, a casual concert series targeted at younger listeners, he quickly stepped aside.) But he has been a driving force behind the Soluna Festival, a spring event featuring multidisciplinary arts projects in venues around Dallas. In New York, van Zweden will face a particular set of challenges: The Philharmonic is preparing for the renovation of its home at the recently renamed David Geffen Hall, slated to start in 2019, which will displace the orchestra for at least two years and cost $500 million. While Philharmonic officials undoubtedly hope van Zweden can hold onto patrons and fundraise during this time, they must also figure out how he can attract younger, more ethnically diverse New Yorkers who (however unfairly) associate orchestras with gray hairs, dead composers, and Byzantine etiquette. That being said, it’s unlikely that a conductor’s youth or a Twitter account alone will galvanize audiences. Nézet-Séguin is as dynamic as they come (he’s prone to tweeting photos of himself working out), and yet the Philadelphia Orchestra has struggled to sell tickets. Just as important are savvy, flexible orchestra administrations willing to take risks. The Detroit Symphony, led by Leonard Slatkin, 71, has won much notice for video streaming nearly all of its programs free of charge. And when Dudamel began his tenure in Los Angeles in 2009, the Philharmonic administration snapped into action with a massive marketing campaign that placed his name in bilingual media, on billboards and bus advertisements around town. Some 18,000 people came to the Hollywood Bowl for a free, five-hour Lollapalooza-style inaugural concert with “The Dude” conducting Beethoven’s Ninth Symphony. Dudamel is also slated to appear in the Super Bowl halftime show on Sunday. Even the most vivacious “Rodrigo” cannot enhance an orchestra’s impact without the support of the often-lumbering institutions behind him. Still, youth often brings new ideas and the energy to make them a reality. Evidence of this can be found at certain smaller institutions. The New Jersey Symphony in December named Xian Zhang as its next music director—a rare appointment of a woman conductor and one who has championed composers from her native China as well as blood-and-guts Italian operas. Other fresh-faced maestros can be found at the Orchestra of St. Luke’s (where Pablo Heras-Casado, a 38-year-old Spaniard, imaginatively juxtaposes old and modern pieces), the Louisville Orchestra (led by Teddy Abrams, a 28-year-old composer and improviser who spearheaded a Louisville Concerto featuring local rock, hip-hop, and bluegrass artists), and the Alabama Symphony (where Venezuelan Carlos Izcaray, 38, has brought eclectic programming to the deep South), to name three. But with only so many qualified youthful conductors in the pipeline, orchestras require a more nimble outlook. They should be not afraid to pursue projects that—as in the visual arts, theater, and film—tackle the topical issues of the day, as the Baltimore Symphony did following the unrest in the city after the death of Freddie Gray. Older conductors too must be willing roll up their sleeves (and yes, ditch the tuxedos) and travel to Spanish-speaking neighborhoods, learn social media skills, and collaborate with artists from different disciplines. More than merely being an attractive “brand,” conductors must put in the time and energy to build excitement around their orchestras, ensuring that they remain the living, breathing entities they were meant to be.